Notes: Listed as Blue Valley Creamery in 1890 plat map. Biennial report of the Dairy and Food Commissioner of WI: P.P. Monum and Ole Venum shown as owners of a "cheese factory" in 1890. Both farms were just E and NE of this factory with no other factories near by. Mt. Horeb PO 1901, 1913, 1916, 1922, 1930, RD 5 1906, RD4 1909. In 1894-1896 there was a Grit Post Office with Ludwig Sutter, Jr. as postmaster. 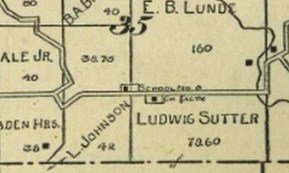 Ludwig Sutter is shown as the owner of the property on the 1899 plat map. Therefore it is probable that the post office was located in the cheese factory. (see lower map).